”Google Rewards Centre” is the PUP that uses misleading techniques to prevent removal. Use Reimage to locate malicious components and get rid of them faster than with uninstall instructions. A full system scan blocks virus reappearance and prevents traffic to malicious domains. Are “Google Rewards Centre” notifications real? How does the adware manage to occupy the device? If the Internet takes a significant part of your daily life, you are aware that there are tons of cyber deceptions like ”Google Rewards Centre” virus. This is none other than adware which displays fake messages trying to persuade you of prizes which await you. Crooks expect that users believe in the credibility of any content which is labeled under Google logo. However, keep in mind that it is common scam strategy. Therefore, start ”Google Rewards Centre” removal right away. You should not delay the process because the adware might start gathering not only non-personal information but personal data as well. 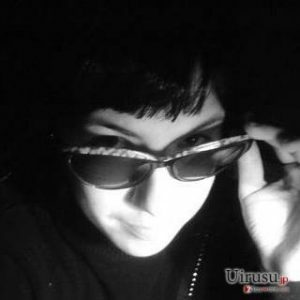 There is a possibility that unknown and suspicious users and online companies will acquire such data. If this scenario does not raise pleasant thoughts, remove Google Rewards Centre malware. The idea of winning a lottery seems to be still lively and prevalent in modern users. Thus, who would refuse the offers to get a new iPhone or a laptop for free? The adware uses the same bait to persuade you to answer several ridiculously easy questions to receive the award. Once you do it, you are required to provide a phone number or an email address. 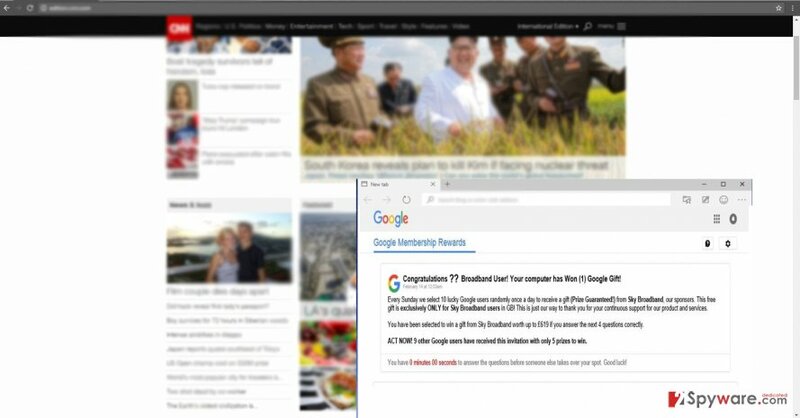 After you do it, expect Google Rewards Centre ads to cram not only your Inbox but the computer screen as well. Moreover, the commercial offers become highly annoying and intrusive over a while as digital voice nags you with suggestions to complete surveys and win prizes. However, more severe consequences lie behind this behavior. The appearing pop-ups tend to facilitate Google Rewards Centre redirect. Likewise, you might spot additional redirect tabs opening alongside your primary tab, or you might be misguided to an unknown web page instead if your expected destination. Keep in mind that these websites might contain unpleasant and highly destructive “surprises” – viruses. Thus, for the safety of the operating system, remove the adware. Reimage speeds up the elimination procedure. If you tend to install new applications quickly, it is not surprising that a PUP settled on the computer. You have enabled “Google Rewards Centre” hijack when you hit the “Install” button after choosing the “Recommended” settings. Unfortunately, this is dominant vice among the majority of Internet users. Therefore, this distribution of adware continues to be profitable. To avoid committing the same mistake again, we would like to advise a different way of installing new programs. First of all, upon initializing the installation guide, make sure you opt for “Custom” settings. Afterward, unmark all optional add-ons which often to happen adware and browser hijackers. It is not difficult to remove Google Rewards Centre virus if you opt for automatic elimination. For that purpose, an anti-spyware application comes in handy. Check whether it is updated and run the scan. Usually, the elimination takes a moment. You can be sure that the adware is completely eliminated. In addition, you might check manual “Google Rewards Centre” removal guidelines. Carefully implement each step not to miss any important detail. Next time you download a program, check its publisher and read user reviews. Here, look for ”Google Rewards Centre” or any other recently installed suspicious programs. Wait until you see Applications folder and look for ”Google Rewards Centre” or any other suspicious programs on it. Now right click on every of such entries and select Move to Trash. When in the new window, check Delete personal settings and select Reset again to complete ”Google Rewards Centre” removal. Once these steps are finished, ”Google Rewards Centre” should be removed from your Microsoft Edge browser. Here, select ”Google Rewards Centre” and other questionable plugins. Click Remove to delete these entries. Now you will see Reset Firefox to its default state message with Reset Firefox button. Click this button for several times and complete ”Google Rewards Centre” removal. Here, select ”Google Rewards Centre” and other malicious plugins and select trash icon to delete these entries. Click Reset to confirm this action and complete ”Google Rewards Centre” removal. Here, select Extensions and look for ”Google Rewards Centre” or other suspicious entries. Click on the Uninstall button to get rid each of them. Now you will see a detailed dialog window filled with reset options. All of those options are usually checked, but you can specify which of them you want to reset. Click the Reset button to complete ”Google Rewards Centre” removal process. This entry was posted on 2016-09-23 at 05:49 and is filed under Adware, Viruses. You can quickly scan the QR code with your mobile device and have ”Google Rewards Centre” ads manual removal instructions right in your pocket. How did you remove ”Google Rewards Centre” ads?